Space Sheriff Gavan THE MOVIE - Легендарный Космический Шериф возвращается! In Space Sheriff Sharivan: Next Generation, joining the returning Rika Miura (Kai/Sharivan II), Hiroshi Watari (Den Iga/Original Sharivan) and Yuma Ishigaki (Geki/Gavan type-G) are Abaranger’s Kouichiro Nishi (AbareRed) and Sho Tomita (AbareBlue), Misaki Momose (Lamunea in Kyoryuger: Gaburincho of Music) as Sharivan’s partner Shishi, and Haruna Yabuki (Bishojo Celebrity Panchanne) in a yet-to-be-announced role. Meanwhile in Space Sheriff Shaider: Next Generation, Hiroaki Iwagawa (Shu/Shaider II) and the already confirmed Naomi Morinaga (Annie) are joined by Mayu Kawamoto (High Kick Angels) as Shaider’s partner Tammy, Michi Nishijima (Emiri in Abaranger), Kasumi Yamaya (Rumi in Movie War Ultimatum), Ryoma Baba (Ryuji/Blue Buster in Go-Busters), and Masayuki Suzuki who will be reprising his role of Koichiro Oyama, the bumbling UFO expert who appeared in all three Space Sheriff series. In addition, Shinji Todo (Takuya in the Japanese Spider-Man series) will be appearing in both films along with Honoka (Malsheena in Akibaranger) reprising her role of Elina from Gavan: The Movie. Akira Kushida will not only appear in Shaider: Next Generation, he’ll be doing the main themes for both films. Ryoma Baba is confirmed to become Estevan, the new Uchuu Keiji in Sharivan’s movie and here is his first visual. 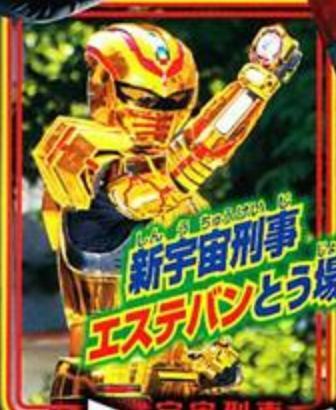 Estevan is just a golden « repaint » of Gavan Bootleg seen in the movie Gokaiger VS Gavan. Is it a lack of inspiration from Toei or is it a true plot point ? Let’s hope for an answer soon. Лично я бы хотел о новом Шариване узнать. Я тоже. Новый боец Шаривана такой обаятельный. И длинные до плеча волосы ему очень к лицу. К тому же у Кая Хьюги, воина Шаривана, такие выразительные глаза. А сам актер Рики Миура хорошо вписался в эту роль. Словом, буду ждать, когда покажут. Посмотреть-то хочется. Фильм Шалибана был шикарен. Не то УГ, что было по Гавану.